After the optimism of Wednesday night Latics were brought back down to earth with a bump as they were outplayed by Gillingham at the Priestfield Stadium. Two goals from Bradley Dack, one in each half, ensured the Gills secured all three points and moved to the top of the League One table on goal difference. Latics drop down to 13th place having won 1 drawn 1 and lost 2. Wigan made one change from Wednesday night’s win against Scunthorpe with Kevin McNaughton replacing Jonjoe Kenny at right wingback. 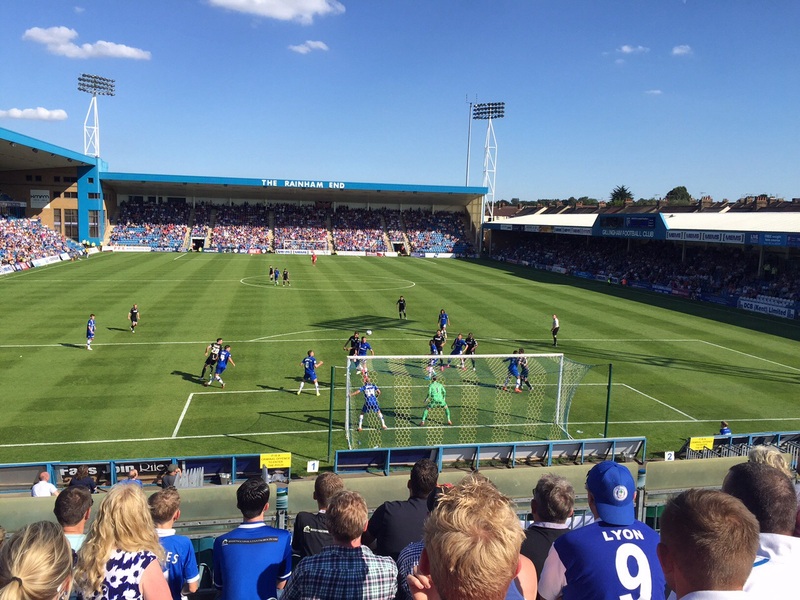 The Gills started confidently with Dack bringing a save from Richard O’Donnell within the first minute. Gillingham pressed and Latics struggled to get their passing game going. Latics did create an opportunity around the 20th minute mark when Michael Jacobs’ free kick was flicked on by Craig Davies but Chris McCann’s header flew just over the Gills crossbar. Latics best opportunity came when Grigg shot from distance after good work by McCann, but Nelson saved comfortably. A rare event for the English Football League took place after 33 minutes when the referee Trevor Kettle gave the players a drinks break due to the exceptional heat. Unfortunately the break may have affected Latics concentration, as they failed to deal with Rory Donnelly’s run down the right and the ball fell to Dack on the edge of the box and his shot straight down the middle of the goal wrong footed O’Donnell. McNaughton then suffered a muscle injury and had to be withdrawn and replaced by Kenny. An out of sorts Francisco Junior was replaced at half time by Sean Murray. Gillingham nearly doubled their lead at the start of the second half but a superb last-ditch tackle by Craig Morgan denied Luke Norris after he looked odds on to score. Latics might have drawn level soon afterwards when Murray’s deep cross found Grigg at the back post but the striker’s effort was well saved at close range by Nelson. However, Gillingham were still the dominant team and Donnelly rattled the Wigan upright and then Norris fired just wide. Caldwell made an attacking change on 75 minutes when Reece James was replaced by Billy McKay. But the points were sealed on 84 minutes when Donervon Daniels conceded a penalty. The big defender allowed Dack to get on his wrong side and then made a clumsy challenge from behind as the striker moved towards goal. Dack got up and comfortably converted the penalty sending the Gills to the top of the league table. Apart from a brief spell in the second half, Latics had been unable to replicate the slick pass and move of the Scunthorpe victory. Several players had been well off the pace on a very hot day in Kent. The team is still in a period of transition but Gary Caldwell will have plenty of food for thought after such a disappointing display. This entry was posted in Bradley Dack, Gillingham, League One, Wigan Athletic and tagged Bradley Dack, Gillingham, League One, Wigan Athletic. Bookmark the permalink.